so for example - if someone completes a cluster of questions appropriately, then a text field appears. These text fields aren't showing. ignore the thing at the top of the shot - not a problem. Can you please confirm first that this is the form https://www.jotform.com/72453145899367 that have the issue? We need to identify first the correct form. TEXT fields in the form are not automatically included in the form submission emails. If you want those TEXT to appear also in the email content, you will have to manually edit the email template and add the TEXTS. In case you were not referring to TEXT fields but the TextArea fields, it is possible that the data of the TextArea fields that uses Show/Hide conditions was being cleared on post submission of form. It was because it was set in the form settings. See the option Clear Hidden Field Values. 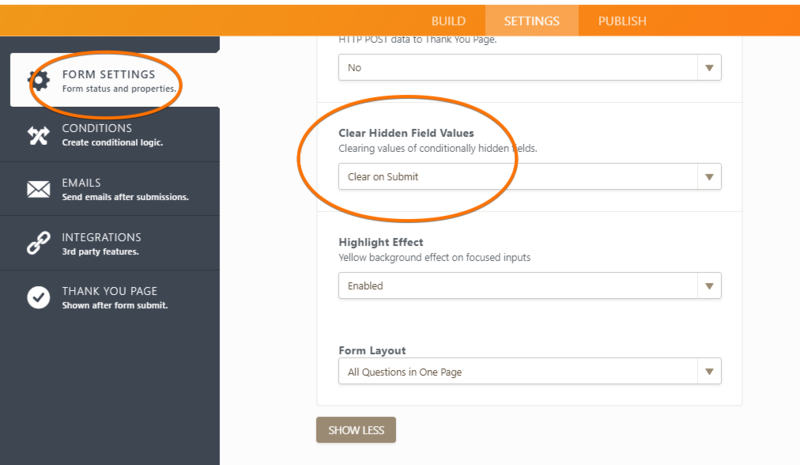 If this is set to Clear on Submit, it will definitely clear the data of conditionally hidden fields. You may need set it to Don't Clear instead. Hi there - yes this is the correct form. Basically i have 'if, then' options. If the if values are all 'correct' it should show a text field which shows on the completed form. I made the settings alteration as you suggested but that's not the problem. it doesn't appear that I can add those texts to teh email template as it doesn't show as an option to include which seems seems a bit ridiculous. Any workarounds you could think of? As my colleague mentioned the Text fields are not included in the email alerts. If you want to add the text fields to the email Notification or an Autoresponder email you will have to do it manually. If the text should be shown inside of an email base on user's answer, you will have to create multiple email Notifications and use conditional logic to send an email with corresponding text fields.